US plastic waste exports to developing countries in south-east Asia rose dramatically in the first six months of this year, as the international fallout from China’s decision to shut its doors to “foreign trash” continues. Unearthed can reveal that plastic waste exports from the US to Malaysia, Thailand and Vietnam shot up from January to June 2018. 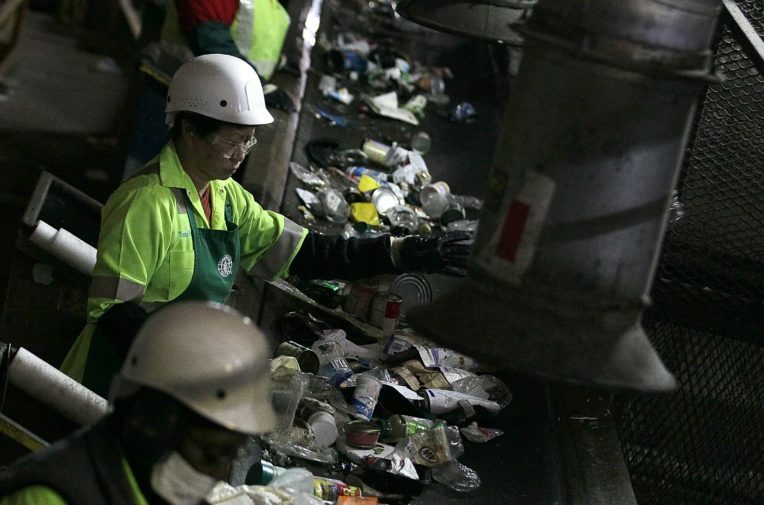 But with these southeast Asian countries moving to impose import restrictions and plastic scrap piling up from California to Florida, the US recycling industry is talking about a mounting crisis in the country. China has historically been the world’s biggest importer of plastic waste, taking in 45% of cumulative imports since 1992, according to a study published this summer. The US sent around 70% of its plastic waste to China and Hong Kong last year. But Beijing’s move to stop importing low quality plastic scrap has forced recyclers in the west to take a long look at their business model. In the UK, figures from the recycling industry have said the sector is “lurching from crisis to crisis”. US plastic scrap exports dropped by almost a third in the first six months of 2018, as waste firms struggled to find a home for their plastic scrap. From 949,789 metric tonnes (2017) to 666,760 metric tonnes (2018). An analysis of trade data from the US Census Bureau found that other countries have accepted more plastic scrap. In the first six months of 2017, a little over 4,000 metric tonnes of America’s plastic went to Thailand, but the country took in 91,505 metric tonnes of America’s scrap in the same period this year. That’s an increase of 1,985%. Malaysia experienced a similar increase, a rise of 273% to 157,299 metric tonnes. Vietnam also saw a significant rise, to 71,220 metric tonnes in the first six months of this year. Exports to Turkey and South Korea also rose significantly in the same period, to 11,224 metric tonnes and 14,760 metric tonnes, respectively. Despite the China ban, Asia remains the main destination for American waste exports. In the first six months of this year, 81% of plastic waste exports from the US went to Asia, a 7% drop on 2017. The influx of western rubbish into these countries has forced some to impose restrictions on waste imports. Earlier this summer, plastic processing factories in Banting, south-west of Malaysia’s capital Kuala Lumpur were forced to close because of residents complaining of air and water pollution. The country’s government announced a new import tax on plastic waste, last week. Malaysia is also tightening requirements on operating permits and is looking to clampdown on illegal processors. Restrictions have also been introduced in Vietnam. In May, authorities in the country announced a temporary ban on plastic and paper waste imports from the middle of this June until October. Two of the country’s biggest ports – Tan Cang-Cai Mep International and Tan Cang-Cat Lai – have reportedly become overwhelmed with plastic and paper scrap since the China ban came into force. In Thailand, the influx of trash forced the government to introduce [story in Thai] inspections of all plastics and electronic waste imports into the country. The country’s authorities have also pledged to send waste back to where it came from if it’s imported without proper description. Experts are concerned that these increasingly popular destinations for US waste do not have the capacity to deal with waste in a safe or environmental way. “Some of these countries just don’t have the infrastructure in ports or roads to deal with an increase in volume of material,” Robin Wiener, CEO of US trade body the Institute of Scrap Recycling Industries (ISRI), told Unearthed. All of this poses an unprecedented challenge for American recyclers. Recycling firms, under pressure to meet higher standards, have seen costs rocket. While they have traditionally paid authorities for waste that could be turned into recycled goods, they are now starting to charge the state for the cost of getting rid of it. Stockpiling has been occurring in California, now the world’s fifth largest economy, and a number of bills are now being considered to cut plastic waste. Coastal cities have historically been more dependent on exporting waste to be recycled.s. San Diego is now facing a potential $1.1m annual charge from its waste contractor, which last year provided the city with a $4m income stream. “The environmental benefits of recycling now come with a cost that we haven’t seen in California before,” Zoe Heller, assistant director of policy development at CalRecycle, California’s state waste management agency, told Unearthed. In towns and cities across the US, firms have been taking a variety of steps to deal with the backlog. Some have suspended their recycling schemes, begun education campaigns or refused to accept certain types of plastic waste. Others have refused to pick up rubbish from outside houses, sent recycling to landfill or burned it. Residents may have to pick up the bill; one town in Vermont is soon to start charging residents for their recycling. Alternatively costs could be passed on through higher taxes. In total, US plastic waste exports in the first six months of 2018 were worth $270m, a drop of almost $90m on the previous year. Bell, from Waste Management, is clear about what he thinks needs to happen: “We have to encourage manufacturers to use a high proportion of recycled content in their products. And we have to make sure recycling is clean to begin with. This piece was also featured in the Guardian.